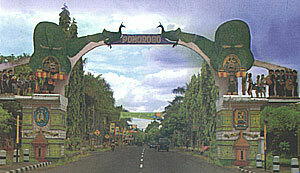 Ponorogo Regency is located on the southwest of Surabaya. The distance of Ponorogo regency to the capital of East Java province is about 200 km. This distance could reached by bus during 5 hours. While, from Jakarta be at 800 km. From Solo, the city of Central Java could be 3 hours through Wonogiri or 4 hours through Madiun. Usually Madiun becomes the capital of transit when the travelling person travelled by the train. In the meantime, when they want to travel by aircraft they could change to plane in Surabaya or in Solo. From the South, could be served by Pacitan bus route to Ponorogo and Trenggalek - Ponorogo. There are various sorts of the route of the rural Transport (ANGDES) and the urban Transport (ANGKOT) In the personally regency. They connected the subdistrict with the capital of the regency. Could be said, there is no subdistrict that was not covered by the public's transport. Beside 'ANGDES' and 'ANGKOT' they also has pedicab transport, buggy and the taxi bike.